Blink for a second and you might lose sight of him. Rays prospect Vidal Brujan might be baseball’s next speedster sensation; he’s seldom been denied this season in his quest to humiliate the opposition with his wheels. Brujan, an undersized 20-year-old 2B, has stamped his name on the prospect map with a dominant season. His accomplishments have been frequently overshadowed by the likes of organization-mates Willy Adames, Brendan McKay, Wander Franco, and many of the other high-profile prospects in one of the deepest farm systems in the game, but Brujan is quickly emerging as a potential table-setter for many years to come. Brujan has performed admirably at the A/A+ levels in his age-20 season, despite measuring in at nearly 1 1/2 and 2 1/2 years younger than the average player at these levels, respectively. Standing in at just 5’9”, 155 lbs, his frame is a far cry from the intimidating build of an Aaron Judge or Giancarlo Stanton in the box, but his raw athleticism makes up for the size. Brujan is a wiry quick-twitch athlete who currently utilizes his 70-grade speed to scooter around the bases like it’s little league. In the same way that Judge makes many ballparks seem miniature with his uncontainable light-tower power, Brujan makes the basepaths look short with his cheetah-like speed, which is accompanied by phenomenal instincts on the basepaths. This season, Brujan leads the entire minor leagues with an astronomical 112 runs scored, as he’s wreaked havoc on the basepaths with his plus-plus speed. Accompanied by all the runs has been 55 stolen bases, a huge improvement from the mere 16 he stole last year, granted it was in 246 fewer PA. Many players gifted with elite speed struggle to reach base at a respectable clip, but Brujan is nearly as menacing a threat at the plate as he is on the bases. He’ll naturally garner comparisons to some of the game’s most notorious kings of thief like Dee Gordon, Billy Hamilton, and Trea Turner, based on the sheer scarcity of players possessing elite speed in the game today. However, Brujan exhibits the potential for significantly superior plate discipline than most of these speedsters, which allows for his speed to be put on display more frequently. The switch-hitter currently carries a .320/.403/.459 slash line, which has translated into an impressive wRC+ of 148. The differentiating skills between Brujan and his lightning quick peers are going to be plate discipline and the ability to put pressure on the defense consistently by putting the ball in play. The graphic below exhibits how his 2018 minor league numbers in these areas stack up against some of the most successful base stealers in baseball today. As you can see in the table below, some of the big leaguers on this list fail to maximize the potential value of their speed by exhibiting ineptitude in the plate discipline department. Obviously they are competing against the best pitchers on the planet, while Brujan is only going up against people in the low minors, but it’s extremely encouraging to see his early proficiency in these areas. Only MVP candidates Jose Ramirez, Mookie Betts, and Lorenzo Cain have walked at a higher clip than Brujan. Dee Gordon is significantly quicker than Brujan, but the impact of his speed on the game is limited by the fact that he draws walks at microscopic rates. According to BaseballSavant, Billy Hamilton is tied for the fastest sprint speed in 2018 (min. 100 AB), yet his mediocre 7.9 % walk rate and poor 24% strikeout rate also handicap his ability to impact the game. Brujan’s plate discipline and instincts will allow him to compete with players who possess superior speed for stolen base titles for many years to come. The GIF below exhibits Brujan’s swing mechanics from the left side of the plate. His small stature isn’t conducive to selling out for power: he’s currently more of a Jose Reyes (in his golden days)-type slap hitter who runs into a ball every once-in-a-while. Brujan uses a low leg-kick timing mechanism to maximize his power. However, on this particular swing he fails to restrain his weight from flying forward, and as a result his hands are restricted from getting the necessary extension through the ball, forcing him to cut himself off and roll over the pitch. Brujan’s swing shows promise from the left side, but developing more consistency with his timing, or slightly modifying his leg kick could lead to further improved numbers. At first glance, the GIF below isn’t particularly revealing: Brujan doesn’t even swing at the pitch, so there shouldn’t be anything to analyze– right? Actually, this pitch is nearly as relevant as any to the big picture. Upon closer look, Brujan completely ruins his chances at driving the pitch with his atrociously-timed load, as his front led has landed before the pitch is even close to the plate, and he’s lunging forward as he lands hard on his front leg. Once again, Brujan generates tons of potential energy with his powerful load, but the majority of this force is lost by the time the pitch reaches the plate. Brujan’s swing from the right side fails to generate close to the same magnitude of potential power as it does from the left side. He uses a timing mechanism that consists of tapping his front foot to load. On this particular pitch, Brujan double taps his foot, causing his balance of weight to become discombobulated, resulting in essentially the same result as the one from the GIF of him swinging lefty. Brujan’s mechanics from the left side are far more conducive to him becoming as much of a threat with the bat as he is with his wheels. All of his 9 HR this season have come from the left side, which should come as unsurprising news after evaluating his swings from each side of the plate. The ability to consistently put the ball in play has become something of a lost art in today’s game that’s dominated by the three true outcomes (HR, K, BB), and this skill, coupled with his elite speed and keen eye, helps to allow Brujan to maximize his frequency of getting on base. I’d like to see Brujan reform his timing mechanism from the right side, which should help him generate more power and improve the quality of his contact. His BABIP is likely a little bit inflated, as it currently sits at .357 on the year, indicating he’s likely been assisted by some moderate luck. However, considering the fact that Brujan has a lofty 51.6% Groundball Rate, his speed definitely plays a role in this figure, meaning it might be more sustainable than it appears at first glance. 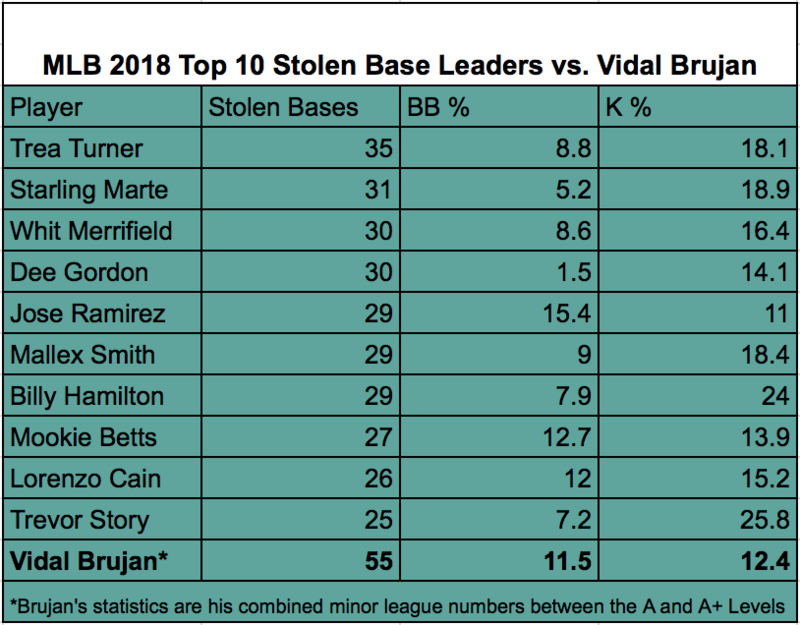 Vidal Brujan has the potential to be baseball’s next great speedster, and his stock has skyrocketed with an impressive performance this year, in which he’s improved across the board offensively. Still just 20, Brujan could push into the high minors next season, and should definitely be up with the big league club sometime in 2020. As if the numbers he’s posted this season haven’t been incredible enough, Brujan has clear mechanical changes and improvements to make, especially from the right side, that will allow him to become even more of a threat at the plate. Fans of AL East teams should be concerned: this Rays farm system is absolutely loaded, and Brujan is one of many studs that could help make the team a legitimate World Series contender by 2020. If other owners in your dynasty league have yet to jump on the Vidal Brujan train, then you should pounce on this speedster immediately. I am the Founder of MajorLeagueBanter.com, and a contributor to Community Research on Fangraphs. Current student and player. I'm a die-hard Yankees enthusiast, and an avid baseball fan. As a Rays fan, I have been pushing for this kid for the past couple year. Really great break out year for him this year. Kid just made KLaw’s Top 100 Prospects at #59!